[Developing -- Updates and video after the jump. MP3 audio here.] 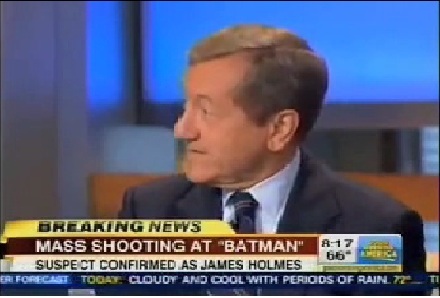 Hours after mass murder at a 12am showing of the new Batman film, ABC News reporter Brian Ross went on Good Morning America and speculated that the killer could be a Tea Party member. Ross appeared Friday morning during live coverage and told viewers, "There is a Jim Holmes of Aurora, Colorado page on the Colorado Tea Party site as well. Talking about him joining the Tea Party last year. Now, we don't know if this the same Jim Holmes." Co-host George Stephanopoulos eagerly touted Ross' accusations: "You've been looking- investigating the background of Jim Holmes here. You've found something that might be significant." Stephanopoulos added, "Okay, we'll keep looking at that." A San Diego woman who identified herself as James Holmes' mother told ABC News she had awoken unaware of the shooting and had not yet been contacted by authorities. She immediately expressed concern that her son may have been involved. Ross immediately attempted to make the shooting political. At 4:13am, he tweeted, "No shortage of gun shops in the #Aurora area, more than 20 listed plus pawn shops #Colorado #batman #shooting." In another tweet, he added, "#colorado gun laws tightened after Columbine shooting with tougher background checks by Colorado Bureau of Investigation on ppl buying guns." This story will be updated with more as it develops. See Breitbart for additional information. The James Holmes arrested at the Aurora theater was 24 years old and seems to be from Denver, CO, according to a Facebook profile (a similar Facebook profile linked by a local news reporter has not been confirmed as the suspect's profile, either). There are many people with the name "James Holmes" in the area, and the James Homes on the Tea Party website could match a James Homes from Aurora, CO who is in his fifties and therefore does not fit the description of the suspect. More evidence that Ross, Stephanolpoulos and ABC rushed to blame the Tea Party without confirmation that the suspect is also the Tea Party member. GEORGE STEPHANOPOULOS: I want to go to Brian Ross here, because, Brian, you've been looking- investigating the background of Jim Holmes here. You've found something that might be significant. BRIAN ROSS: There is a Jim Holmes of Aurora, Colorado page on the Colorado Tea Party site as well. Talking about him joining the Tea Party last year. Now, we don't know if this the same Jim Holmes. But it's Jim Holmes of Aurora, Colorado. STEPHANOPOULOS: Okay, we'll keep looking at that. Brian Ross, thanks very much.